I have just two words of advice for anyone who wants to start growing vegetables for the first time. I speak from experience having raised vegetables in a traditional garden plot and now in raised beds. Once the raised beds are set up, it is far easier to grow vegetables in them than in a traditional garden plot. Spring prep? With a traditional garden plot, you have to wait for the perfect conditions when the ground is not too wet to get out and turn the soil over and prepare it for planting. You can either dig it by hand or use a roto-tiller; neither is as easy as it sounds. Then once the garden is dug up and smoothed over, you generally figure out where the rows will be and hill them up a bit, leaving paths in between them. Tired yet? With raised beds, the soil dries out faster in the spring, so on the first sunny day you can just whistle your way out to the garden, remove the few weeds that might have sprouted, rake smooth, and plant. Summer care? With a traditional garden plot, there will come a time, generally around mid-summer, when you will stand there and look at the WHOLE garden and see that it is full of purslane and foxtail, crabgrass and false daisy. Weeds! You can’t even think where to start weeding, and so you abandon the garden to the weeds, venturing in only occasionally to see if perhaps under that morning glory vine you can find those pepper plants you lovingly grew from seed, carefully planted out in the spring, and then abandoned to the weeds. With raised beds, there will still be weeds, but you can attack them one raised bed at a time and see real progress as you work. Fall clean up? With a traditional garden plot, it seems like such a big job to clean up the garden that you often end up leaving everything, including your good intentions to clean up the garden, to the ravages of frost and snow so that in the spring, you have to first clear off the old tomato vines, pepper plants and corn stalks before you can dig it all up again. And if you do clean it all up in the fall, you still have to dig the garden up again in the spring. With raised beds, you can clean up each bed as it winds down, top it off with some compost, and then in the spring, you can start planting again within minutes of deciding it is a perfect spring day to do so. Another advantage of raised beds? You can start out with just one, perhaps only four feet wide and eight feet long, and then once you taste the success you’ll have growing vegetables in it, you can add more beds as time permits. Eventually you’ll have a nice big garden and you’ll be growing all the vegetables you could ever eat, plus some extras for the neighbors, your co-workers, family, and perhaps a food pantry nearby. Two words make it all possible… Raised Beds. Thank you Carol, for an interesting and informative post. I am considering at least 1 raised bed for veggies, this spring. I couldn't have said it better myself. I garden in 20 or so raised beds of various sizes (from 3 x 3 to 4 x 12) and a gazillion containers. Raised bed gardening is absolutely the way to go; and you do a nice job of laying out why. And thanks for the nod to the food pantry. It's important! 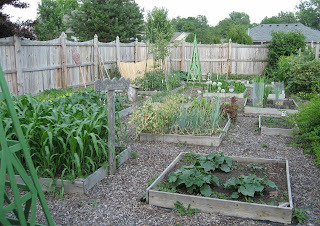 I really want a veggie garden -- in raised beds. The rabbits and deer are such a problem that "raised" may have to be up on my deck! Why don't you show us how you constructed yours, Carol? I'm thinking of putting in a couple for my kids to garden in. It will give them that easily managed space that you describe here, and they can try ornamentals or edibles, or both. You didn't mention using raised beds to avoid having to dig out rocks, but that's a big consideration in my new garden. Raised beds are THE way to go! I'll be adding more beds as I can but your options are much greater with raised beds. Once again, you're completely right! I couldn't imagine gardening in the rocky clay soil we have here. Raised beds are the way to go! We started converting our garden over to raised beds this fall. Even though they have only been in for a short time, I can see a big difference in the work and produce. One thing I have noticed, the weeds come out easier. Thank you Carol for a great post, I so agree with you I'm all for raised beds. Your Veggie garden photos looks very nice and tidy. You make raised beds sound very tempting Carol. And if I ever decide to grow veggies again, I will have raised beds. You've convinced me ... now if I just had a place to put one, I'd be on my way to growing great veggies the May Dreams way! You make it sound so easy Carol. When you made your raised beds did you kill the grass that was inside the raised bed? How did you do that? Did you just cover it with good soil? Or did you put newpaper over it first then put the soil in? I think the best advice is to start small. I might just do that this year. That is very inspiring, there will be raised beds popping up all over the place now!! I agree....I had my husband build some raised beds last year, and the weeding, at least, was much easier. I meant to mulch the paths but never got to it, so that'll be the first thing I do this spring. As to the grass under where you put the bed, I'm not sure how Carol did it, but my husband tilled the entire garden, then we put the frame down and used the "extra" dirt leftover from tilling to begin filling the beds. I started out with making a single raised bed four years ago (almost exactly four years ago, in fact!). The following year it became two, and then we moved to Canada and last year I was dealing with nine large vegetable plots (to which I'm adding three raised beds in the greenhouse this year). I'm just saying be careful out there. You start with one little raised bed and the vegetable-growing habit can very quickly get WAY out of control!!! Raised beds are absolutely the way to go. In year round gardens they are easier to work in the winter because they don't get too wet. And, as you can see in your photo, they are pretty! I agree with Pam. Show us how you make them. Lovely to see an early encouragement to spring arriving...well, probably later out here in MA, but never mind. Thanks for the raised bed thoughts! Of course, yours are all beautiful with new wood...*sigh* I'm afraid mine are quite ugly, as they were repurposed/scalvaged timber from the trash... but they work! You may have convinced me, Carol. I've copied out your post for Tom to read and then we'll talk it over. I've just never liked the look because to me, they look too much like a cemetery. :<) But you described the advantages so very well, that maybe it is time to do this. Thank you for such an informative post, Carol. Agree 100 % about raised beds, which hubby has enjoyed for 6 years now growing tomatoes, peppers, etc. In addition, he began using red "plastic mulch" to keep out any and all weeds. It not only worked 100% on that goal, but also increased plant production by stabilizing soil temperature (including needed higher temps in spring), and reduction in watering requirements. Carol, Thanks to you I started with raised beds last year and as you probably know I've really enjoyed two seasons of growing some wonderfully good veggies in those two beds. Due to some budget constraints this year I had to make some choices when enlarging the garden a couple of weeks ago. Once I added up the cost of doing three more beds I had laid out in plans ... I (sort of grudgingly, mind you) decided to try traditional gardening in the expanded area and forego (for now anyway) building more raised beds. It's a lot to learn the traditional way when I'm still learning the raised bed way. Things are different here than there... I've got great soil to start with and I've brought in even more to mix with what I have. We don't have snow of course. My clean up is July/August to get ready for the fall vegetables planted in August/September. I think my biggest issue is learning how to rotate the crops. Anyway, wish me the best (I know you do) and I figure if it doesn't work for me this way I will certainly know for sure that I will need the raised beds in the fall. Great post as always and I do agree with your advice! You can come see what I've done so far here. Any advice is welcomed. I couldn't agree more Carol. This fall I appropriated some sunny side yard and built a raised bed out of pavers. I laid a thick layer of newspaper over the grass and filled the bed lasagna-style. I can't wait to plant it! I had been thinking about raised beds, mainly because I have scoliosis and the two don't mix (scoliosis and gardening), I really struggle to do any gardening but I love it so much I can't stop, despite the pain! I wouldn't know where to start with raised beds but I am sure my friend's husband (who is a carpenter) can help me there, I have lots of wood that I have kept so I think I could make some, yours look great! I am so desperate to have my garden looking like I am growing, I have a few things on the go but I look so basic compared to everyone else!